After the disaster that was The Signature of All Things, a colleague of mine suggested a book that better fit my Game of Thrones interests. 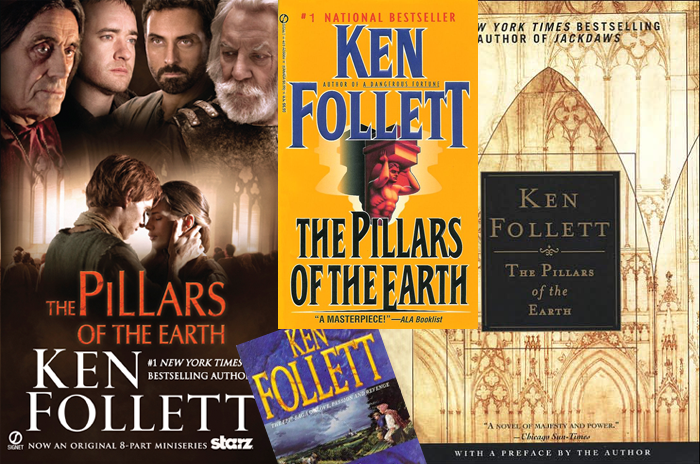 I'm constantly surprised at how well my work colleagues know me because The Pillars of the Earth was definitely up my alley. The novel centers around the building of a cathedral in the 12th century. The narrative follows the lives of several main characters who live in the town where the cathedral is located. I was particularly enthralled by the various relationships in the novel. Coming from reading a book where the main character had very little real connections, it was nice to see so many characters who had close ties to one another. I also particularly liked that one of the novel's protagonists was a strong female entrepreneur. Novels set in medieval times rarely feature independent women. If there was one plot line I disliked it was the constant repetition of revenge. After one bad idea was foiled you'd think the "bad guys" would stop seeking vengenace. However, the same two characters continued to plot against their fellow neighbors throughout the novel. The good versus evil storyline reminded me of Harry Potter and Voldemort. I was only slightly annoyed with the idea of seeking retribution, what I was fully frustrated with were the architecture descriptions that took up half the book. At a certain point I stopped reading the design details and skipped to the parts about the characters themselves. I'm really happy to have read this novel and I am now enjoying the sequel! I can't wait for my mom and I to rent the DVDs on Netflix and see if the mini-series rendition lives up to the novel's standards.